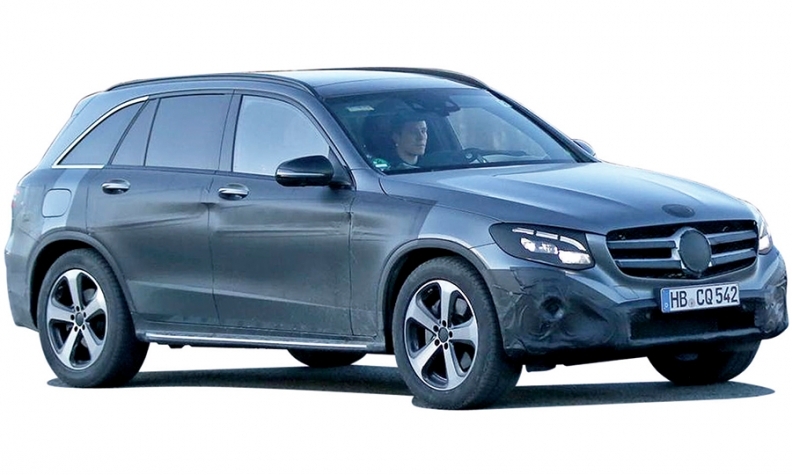 The Mercedes-Benz GLC compact crossover, shown in this spy photo, will be more rounded than the GLK it replaces. The Mercedes-Benz GLC that goes on sale in the fourth quarter will be roomier and more rounded than the GLK it replaces. Spy photos of the redesigned -- and renamed -- compact crossover reveal a longer wheelbase and wider track, giving it more interior space and making it more competitive with the BMW X3 and Audi Q5. Mercedes is making the GLC bigger and more luxurious because the smaller GLA is now the brand's entry crossover. The compact crossover segment has become more crowded with larger and better-equipped competitors since the GLK went on sale in 2009. The GLC also has a different look from the boxy GLK, with flowing lines and an almost coupelike rear. Much of the GLC's technology and layout are expected to carry over from the C-class sedan. That includes the safety and convenience features packaged as Intelligent Drive and advanced infotainment and connectivity systems.